The cloud can be so much more than just a place to store files. Storage is often the first need companies identify that brings them to cloud storage, but the additional benefits of cloud computing extend far beyond simply storing data. Physically backing up data can be expensive. There’s a cost for the hardware and software you use – and in the event of a disaster, there are costs for data recovery. From the hardware investment to the personnel required to maintain the infrastructure, on-site storage costs add up. With the cloud, you pay for what you need, as you need it. Cloud storage reduces the need for extensive on-site infrastructure, eliminating much of that initial hardware investment. 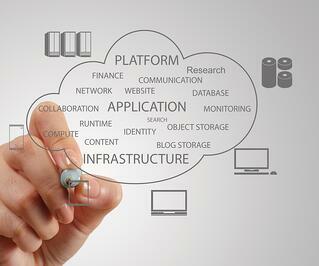 Rather than a capital expenditure, cloud services are a monthly operational expense. From application updates to server backup, many aspects of the cloud environment can be automated. This provides peace-of-mind and frees up any internal resources that had previously been performing these functions. For businesses that use a digital network, there will likely be a time when you'll need more bandwidth – and you'll need it fast. Whether it's because you are experiencing growth or have a temporary need for space or speed, a cloud environment can adjust quickly to meet your needs. A call or email to your cloud services provider is all it takes. When utilizing the cloud, you increase your company's capacity for collaboration among employees. Any employee, no matter where they are, can access their files and work with other employees. They can follow along with the progress of a project and receive updates in real time. Traditional collaboration often requires files to be emailed back and forth between employees. In that situation, only one employee can work at a time, and a file can end up with a number of different versions, formats, names and storage locations. Cloud computing simplifies and organizes group collaboration by allowing multiple employees to work from one centrally stored document. While not every job lends itself to working from home, many office jobs have some component that could be done remotely – which employees appreciate. In fact, a recent study found that over 40% of people would give up a portion of their salary if they were offered the option to work from home. Cloud computing allows just that – without interrupting productivity. An employee can access their workstation remotely just as though they were sitting at their desk. When you purchase and house on-site computing resources, the expense falls solely on your organization and often results in under-utilized hardware. But with cloud computing, you benefit from a natural economy of scale. Your server space and costs can be shared with other cloud users, resulting in more efficient utilization of equipment and lower realized costs. An additional benefit of cloud computing is reduced energy consumption. The efficiency of cloud computing means more actual computing is done per kilowatt-hour of energy used, compared to onsite equipment. A study by Lawrence Berkeley National Laboratory and Northwestern University estimated that cloud computing could save 23 billion kilowatt-hours of electricity, enough to power all of Los Angeles for a year. Many companies find that they’re able to remove a portion of their local servers, save even more money on their energy bill and add "being green" to their list of differentiators.